The Beatles would be amused. The Man in the Sea Museum is home to not just one, but three yellow submarines. Smallish vessels, mind you. None equipped with bunks. Strictly for day trippers. "It may be that these subs were painted yellow to increase their visibility in the water," said nine-year museum employee Mike Degroote, whose knowledge of the underwater world is rock solid. "Or maybe the song had something to do with it." The largest among the three, a battery-powered Beaver Mark IV, is mounted on I-beams on the museum floor. It is big enough to have accommodated five aquanauts. Even so, it pales in comparison to the most significant artifact at the museum, Sealab 1. Sealab 1 was built at the Navy lab in Panama City Beach in 1964. The project was spearheaded by Capt. George Bond, the Sealab program&apos;s medical director. Bond was committed to studying the effects of living and working undersea for extended periods of time. Sealab 1, a steel, watertight capsule, was towed to Bermuda, where it was deployed in 193 feet of water for a scheduled 21 days. Bob Barth, for whom an aquatic training facility at Naval Support Activity Panama City is named, was the lead diver on board. An approaching storm cut the mission to 11 days, but Bond had proved the feasibility of "saturation diving" - remaining at depth when nitrogen in a diver&apos;s body reaches saturation levels. The success of Sealab 1 proved to be of great interest to the offshore oil industry, which proceeded to undertake saturation diving projects of its own. Sealab 1 is located outdoors at the museum and is visible to passersby on Panama City Beach Parkway. It is flanked by a decompression chamber and a personnel transfer capsule that was used by divers to move from the lab into the chamber. The museum hopes to restore Sealab 1 to its original condition in time for its 50th birthday in 2015. The Man in the Sea Museum is operated by the non-profit Institute of Diving, which was founded by Sealab 1 personnel who wished to preserve the history of the project. While Sealab 1 is central to the museum, various exhibits combine to trace the history of man&apos;s continuing efforts to "explore the mysteries of the deep sea." Other displays, including a collection of mines, related to maritime warfare. A contraption resembling a giant king crab generates more questions than any other artifact kept outdoors. Called a "minesweeping hydrofoil," it was towed behind a helicopter and generated a magnetic field that detonated mines. It was built in 1985; later editions of hydrofoils remain in use today. Inside the museum, visitors encounter a collection of diving helmets dating to 1916 and human-powered compressors that were used to deliver air via hoses to divers at depth. It is the stuff of Jules Verne. Detailed dioramas depict the rescue of crew members from a Navy submarine, the USS Squalus, which sank in 1939, and the discovery in bridge-building workers of Caisson disease, today known as decompression sickness or "the bends." An exhibit contributed by the National Association of Cave Diving recalls a research project conducted to explore the world&apos;s largest cave at Wakulla Springs, south of Tallahassee. Early aqualungs, patented by George Bond&apos;s friend, Jacques Cousteau, in 1945, are on display. Cousteau used retired fire extinguishers as air tanks and developed a regulator that enabled divers to breathe air at depth without damaging their lungs. An outlandish pressure-resistant diver&apos;s outfit called a gym suit and resembling a giant Pillsbury Doughboy stands at one corner of the museum. Elsewhere stand MARK V dive outfits of a sort familiar to anyone who has seen the movie "Men of Honor." Displays of rebreathers and Swimmer Delivery Vehicles (SDV&apos;s) will interest people who share fascination with Navy SEALS. Rebreathers recirculate unused oxygen in a closed system that doesn&apos;t give away a diver&apos;s position because it emits no bubbles. SDVs are used by SEALS to stealthily move underwater from submarines to shallow water. 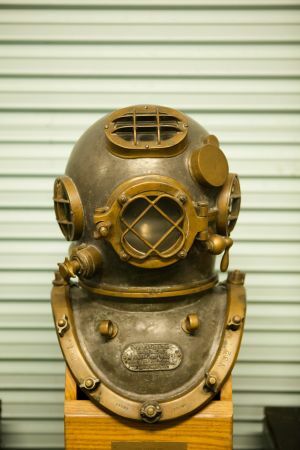 The Man in the Sea Museum, located one mile west of Pier Park, invites everyone to stop by and learn about the history of diving while exploring the mysteries of the underwater world. It is open Wednesday through Saturday, 10 a.m. to 5 p.m.
Get into more great adventures in Panama City Beach!